"Democrats can't find a Smocking Gun tying the Trump campaign to Russia after James Comey's testimony," the POTUS wrote on Twitter. 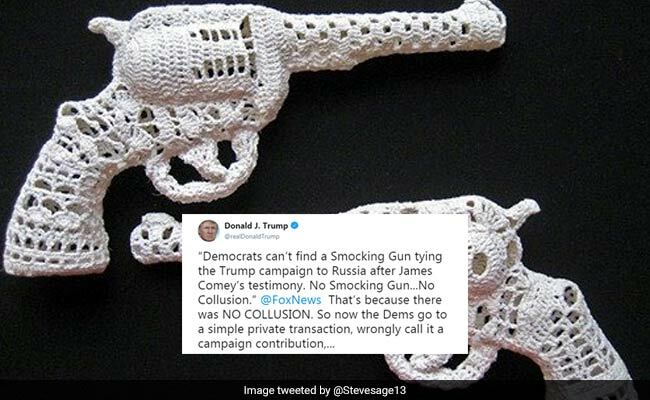 The "smocking gun" tweet has led to a lot of hilarious jokes. US President Donald Trump is no stranger to typos and strange spellings. He is, after all, the man who gave us the gem that was covfefe. And it seemed that the popularity of covfefe had remained unmatched, in spite of Mr Trump's many other typos - up until now, that is. In a tweet posted a day ago, however, Mr Trump made a typo that has since then inspired thousands of jokes and memes. One can safely assume he meant 'smoking gun' and not 'smocking gun'. The tweet was posted as part of a series of tweets regarding the Robert Mueller probe into Mr Trump's potential dealings with Russian officials. With its misspelled word, the tweet quickly prompted a flood of ridicule and inspired a ton of memes and jokes on social media. We collected some of the best ones for you. Which tweet made you laugh the hardest? Let us know using the comments section below.